The new law gives people more rights about how their personal information is handled. You can find out more about this on the Information Commissioner’s Office (ICO) website here . 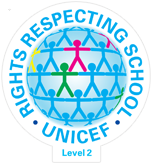 If you want to use one of your new rights please contact the school here and one of our team will be in touch with you. We have a Data Protection Officer who is Robert Bullett. He can be contacted through the schools’ DP service by email: Robert.Bullett@london.anglican.org or by telephone: 020 7932 1161. Our catchment area is very small and so our families walk, cycle or scooter to school. There is adequate pay and display parking in neighbouring roads for the small group who by necessity may have to drive on some days. Our school supports Camden’s Green Transport Strategy which aims to reduce traffic on the school run, to promote a healthy lifestyle and reduce pollution. It is important that new parents and staff understand and are aware that there is no facility for parking at school. There are cycle and scooter racks available on site for parents, children and staff. Gates open at 8.45am and a senior member of staff supervises the playground. School starts promptly at 9am after a traditional bell is rung. Punctuality is important for everyone at school just as in life! Constant late arrival is bound to have a detrimental effect on your child’s education. Late arrival results in disruption, missed explanations and introductions to school work, as well as the distress and embarrassment of being late. The school gates re-open at 3.15pm. At the end of the day we ask that you wait outside your child’s class, in the playground, for the class to be dismissed by the teacher. Arriving 10 minutes early is a good way to meet other parents. From Nursery to Year 2, the class teacher will dismiss the children one at a time as she or he spots parents. From Year 3 upwards, the children leave the classroom independently and meet up with parents in the school grounds. Please inform the school if you are going to be late collecting your child to avoid any concerns or if someone new is picking up. If we are unable to contact carers of children left late we will need to contact Social Services. We do not have a school uniform but we do have some important guidelines. Please ensure that your child wears sensible clothing to school and that they are able to dress and undress themselves as we do encourage them to look after themselves as much as possible. Please don’t send your child in special clothes as, in spite of our best efforts and our aprons, clothes can occasionally get spoilt. Please take account of the weather each day as your child spends over an hour in the playground during their lunchtime. In summer we encourage hats and a coating of sun cream before school, and discourage bare shoulders and backs. It is very important to name your entire child’s belongings, especially cardigans, sweatshirts and coats. We are delighted to be part of the Government’s Fruit scheme; every child up to and including Year 2 receives a piece of fruit for free as their mid morning snack! We hope that this is then established as a healthy habit and junior aged children may bring their own fruit. We do not allow any other snacks. Children in Nursery also receive a carton of milk each day. From 10.45 to 11 each morning, the whole school has a break altogether. This is supervised by 2 teachers and about 4 support staff. There is a rota of junior classes for specific spaces and apparatus such as the football pitch and the tyres. A box of special equipment, such as ropes and balls, is also brought out each day and classes use it on a rota basis during morning play. We allow only simple stud earrings for health and safety reasons. No charge is made for any aspects of education in school hours such as the provision of books, materials and other equipment connected with the National Curriculum. We ask for voluntary contributions for activities during school time such as class trips and visiting drama groups. As trips are such a huge part of our curriculum and school life, we ask for a one-off donation at the start of the school year towards all trips. For activities outside school hours and damage or loss of property by a pupil, there is a charge. Financial support is always available for the special Year 6 School Journey to Wick Court and the Year 5 journey to Sayers Croft. Our support staff run a Breakfast Club from 8-9am every day. Children can be dropped off early and enjoy a gentle breakfast along with a small group of children from across the whole school. Places can be block booked, or booked on an ad hoc basis. Bookings can be made daily, weekly, monthly or termly and must be made before 11am on the date of attendance. Contact manager Zoe after school in the hall or on zoe.davis@p3charity.org for more information. Staff and parents also run clubs such as 8am football, art and drama. There is good notice each time a club starts, and specific year groups will be targeted, usually for a term at a time. If your child becomes ill during the day, or has a nasty accident, we will always contact you, having taken necessary steps ourselves to ensure your child is safe and cared for. It is therefore vital that contact details are up to date, particularly mobile phone numbers, and that someone is able to come, if necessary, to take them home. We always phone after a head bump, however small, so that parents are alerted to be vigilant should there be signs of concussion later in the day. We are happy to administer medicine in school following appropriate guidelines. Attendance is outstanding at our school, always exceeds the national average and regularly tops the borough! Children love coming to school and we work hard to build resilience and positive attitudes. Please make every effort to keep in touch by whatever means suits you best. You can email or call the office from 8am to explain an absence. If we don’t hear from you we will get in touch. If no reason for absence has been given, you will be contacted promptly by the Headteacher and it may be followed up by the school’s Education Welfare Officer. Holidays within the school term should be avoided; if they have to be taken, prior permission must be sought from the Headteacher. Similarly, if there are special circumstances for missing school, it is important to make a request to the headteacher. Journeys abroad to see family in a country of origin, may be treated as a special case. Please see the Headteacher if you are planning such a trip. The school has an assigned school Nurse. As well as statutory checks, for example, of all our 5 year olds, our Nurse checks hearing and vision and monitors children with particular needs. Please try to attend any appointments set up with the nurse or school doctor. You will be given ample warning of the date and time. We are happy to celebrate a child’s birthday in class. If you would like to bring in small individual cakes or biscuits to share with the class on or near your child’s birthday, at the end of the day, you are most welcome to do so. We ask that you do not bring in large birthday cakes, as it is very difficult to cut and share out without a great deal of fuss! It is prudent to avoid nuts when bringing cakes and biscuits into school. The Headteacher or a member of the Leadership Team are in the playground at the start and end of the day. We aim to make ourselves as visible and accessible to parents as possible. Many parental queries and concerns can be dealt with informally at this time. It is also possible to make appointments with the Headteacher , often at very short notice, through the school office. Teachers too are always available for a ‘quick word’ at the start or end of the day. However, if you need to talk with the class teacher in more detail, please make an appointment, as talking at length at the classroom door or in the playground before or after school is difficult for the teacher and the children. All staff have email addresses and are happy to communicate with parents directly in this way. There is a blackboard at the entrance to the school which details daily events and notices. In addition, there is an external board with current relevant school information, and an internal notice board with staff details and information about local community events. Please download from the links below and sign up for your class notifications. Details of school events, reminders, requests for help and ‘ nags’ are shared in our weekly newsletter. This comes out every Thursday on bright orange paper and is given to the eldest child in each family. Copies of every letter sent home are kept on a lectern in the entrance hall, just by the fish, and spare newsletters are posted up around the school. 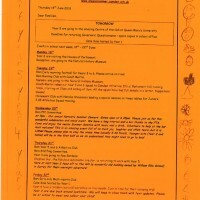 All children in the school are invited to create a ‘ border design’ for each week’s newsletter. Every Friday, classteachers send home a class newsletter, this time on yellow paper, letting you know highlights of the week (children select and write up highlights in turns) important dates, reminders and book recommendations. They are a great way to keep in touch with class life! Please show that you are interested in the school’s teaching methods and in your child’s progress by attending Parents’ Evenings, Curriculum Evenings and Open Days. At the start of a new school year, parents are invited to ‘meet the teacher’ where each teacher addresses the parents about themselves and the year ahead. You are then invited to meet with your child’s teacher one to one later in the Autumn term, at the beginning of the Spring term for a progress report, and finally at the end of the Summer term, when you will receive an end of year written report. You will be given information and advance notice about such events in the weekly newsletter sent out on Thursdays. We operate a system where home and school work together to help your child with reading. Every child is given a bright red folder and a diary so home and school can communicate. Systems for changing books vary in each class but you will be notified at the start of year class meeting. Every child is expected to bring their folder in EVERY day not least to establish a good habit! There is a charge for replacement folders which can be bought at the office. The process of choosing and allocating a place at a secondary school is quite lengthy and it is an anxious time for everyone involved. This process starts a whole year before the children actually leave. But we are lucky that all Camden’s secondary schools are good! Almost all our Year 6 children transfer to local Camden state secondary schools with perhaps just 1 or 2 moving into the independent sector. At the beginning of Year 6, the children receive an information prospectus produced by Camden, which provides dates for open days and evenings to be held at all Camden Secondary Schools.. Broadly speaking, visits to schools take place in September / October, decisions must be made by the end of October and results are announced the following March. There then follows a period for appeals, should your application have been unsuccessful. There are no set catchment areas or automatic transfers. As with applications to primary school, the key criteria, in preference order are: special educational needs, then siblings, then distance from the school. Catchment areas therefore shift according to number of siblings and a school’s popularity in any given year. It is vital to make every effort to visit these schools to see for yourself which one best meets the needs and talents of your child. We positively encourage families in Year 5 to visit all the schools too – and to take your child. Liaison between Eleanor Palmer and secondary schools is an important part of the smooth transition for each child. We have good links with all local secondary schools: drama groups often perform to us; Headteachers always visit to discuss their schools and we regularly take work experience students. Local Authority guidance suggests that every parent who accompanies class trips should also undergo full criminal record (DBS) checks. Our Governing Body has taken the decision not to do this in line with guidance from the National College of School Leadership who run safer recruitment training. This is because of the particular ethos and values of our small community school. Close relationships are central to our school ethos and parental participation in our many trips, that are central to our curriculum, is a much valued part of school life for children, parents and staff. We strongly encourage all parents to take part in trips and school life and would not wish to threaten this. Parents who volunteer on a regular (at least once a week) basis however, will be asked to undertake full DBS checks. If you would like to see a full copy of our Safeguarding and Child Protection Policy you can find it on the link below or ask for a copy in the school office. We are happy to talk further with parents.